Insulation : XLPE compound, (RE-2X….). Triple : three conductors twisted to a triple. Outer sheath : HFFR compound. Rated voltage : 300 V.
Urms core-screen : 1500 V.
installation : - 5° C ~ + 50° C.
Min. bending radius : 7,5 x D.
Insulation resistance : min. 5000 MΩ/km. Capacitance unbalanced : (1 kHz) : max. 500 pF/500 m.
1,5 mm² : 12,3 Ω/km. 1,5 mm² : 40 µH/Ω. 1,5 mm² : max. 120 pF/m, max. 105 pF/m. Design : DIN EN 50288-7. Conductor : IEC 6022 class 2, DIN EN 60228 class 2. Outer sheath : EN 50290-2-27. IEC 60332-3 & DIN EN 50266-2-4. 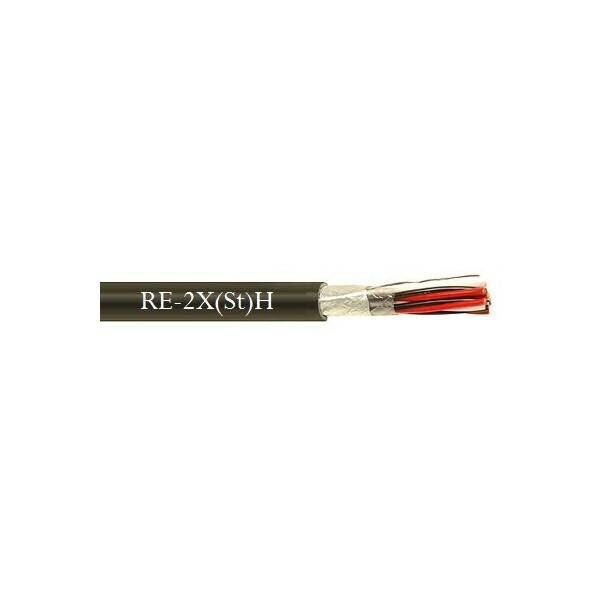 These cables are used in the environments which have no corrosive gases are emitted in the event of fire. In case of fire, these cables inhibit the propagation of the flames whereby the development of smoke is extremely low. Instrumentation cables are not allowed for direct connection to a low impedance sources, e.g. public mains electricity supply. With blue sheath it is suitable for intrinsically safe systems. These cables are not recommended for direct burial.